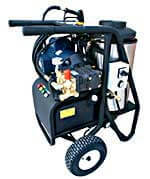 20005SHDE is a hot water pressure washer powered by electric engine. This powerful unit comes with 5 horsepower and it is capable of producing 2000 PSI and 3 GPM. It is equipped with dual wand with side handle and detergent tip, triplex plunger pump with ceramic plungers and stainless steel valves, chemical injection, thermal relief valve, 40’ hose, adjustable pressure, totally enclosed motor, and quick change tips in 0°, 15°, 25°, 40° soap tip. This model is best for medium to heavier duty jobs. Oil fired burner uses diesel fuel or kerosene to achieve a 140°F rise in temperature. This unit is intended to be used outdoors and it must be properly vented if used indoors.